It’s the same stadium that stood here during the 1998 World Cup, but reinvented to the point at which you wonder if it’s even possible that these very same stands were here before. Tonight we visit Saint-Etienne. It’s got quite some history and part of it is in the name. Geoffroy Guichard bought this land in 1930 and built the first stadium, one that exists today. Well, not exactly that one, because initially it had room for 1,000 people and a running track. But growing popularity of ASSE led to gradual expansions and reached peak in 1984, with over 48,000 capacity. With that phased changes and vibrant atmosphere the stadium earned its nickname Le Chaudron (Cauldron). Just a year before France was awarded Euro 2016 hosting rights, AS St.-Etienne were planning a brand new stadium worth €200 million. That plan fell through and public investment ahead of the tournament was never going to reach such levels. That’s why an economic plan was drawn to expand the stands to over 40,000 again and build a brand new roof over 3 stands to remove pillars obstructing view. Of course with much extended infrastructure for fans, both regular visitors and corporate ones. All in all it was to cost under €60 million, but ended up 10 million above that estimate. 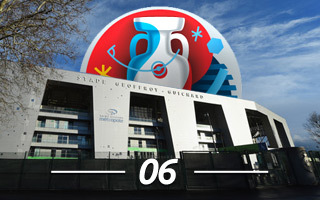 The Cauldron stands in northern Saint-Etienne, close to another landmark building, the Zenith auditorium. The stadium is just 2km north of the centre, so within walking distance. It also has decent connection with public transport (trams and buses), while motorists can use the A72 bypass to access it. Design in Paris, the stadium became truly monumental after the recent revamp. Irregular geometric shape covered the stands with both new roof and façades (east stand’s roof was retained and incorporated into the new arena). Without consistent aesthetics throughout the building and enclosed corners the stadium seems more intimate inside even though it still has 4 independent grandstands. Existing stands were left largely unchanged, perhaps most importantly behind goals, where two large terraces (kops) are located. During league games fans were offered seats without backrests to step on them without fear of damaging the plastic, while for events like Euro 2016 backrests unfold to meet UEFA all-seating criteria. One major change is that small second tiers were built above each kop, increasing the capacity for Euro 2016 to some 42,000. In terms of following AS Saint-Etienne are among France’s most popular clubs. Regardless of results on the field attendances are high and since the redevelopment ended in 2014 average crowds never went lower than 30,000 per game. Keeping up such numbers will secure long-term use of the stadium without it becoming an economic burden.